The Mission to Seafarers Collection explores the early provision of welfare to sailors in Sydney ports and the surprising role of charitable religious organisations in maritime history. ANMM Collection. The museum has acquired an evocative collection of maritime heritage from the Mission to Seafarers, Sydney, which has a history dating back to the early port in 1822. We can now explore the stories of the early provision of welfare to sailors and the surprising role of charitable religious organisations in maritime history. By the 1820s, the Sydney waterfront was bustling with ships from around the world. Tens of thousands of sailors were temporary residents of the thriving maritime township. While the sailors thronged the many pubs and inns of The Rocks area, near the port, they were not known for their attendance at religious services. In 1822 the rector of St Philip’s Church of England, the Reverend William Cowper, instigated the establishment of an interdenominational society that could minister to sailors from different churches. Lacking a place of worship, Cowper and other volunteer clergymen conducted their early services on board the ships in port. For the next 20 years the Sydney Bethel Union Society led in tending to the spiritual needs of sailors in Sydney. Sometimes floating services were conducted on a barge donated to them for the purpose. By 1841, enough funds had been raised to build a dedicated Mariners’ Church, firstly at Erskine Street, near Darling Harbour, and then at a location more convenient to sailors, on the east side of Sydney Cove, not far from where the Opera House now stands. In 1856 a new building was taken up at 100 George Street, The Rocks. This provided what would become the cornerstone of the Seamen’s Mission – a space for ‘reading, refreshments and entertainment’. The role of the mission was to provide welfare assistance and social activities for sailors in foreign ports, as well as the opportunity to attend church services. Sailors flocked to the Mariners’ Church and by the 1880s the Church of England’s Seamen’s Mission had been established. The mission and the Bethel Union worked together and after various moves and amalgamations, in 1895 the Missions to Seamen took over the lease and running of the Mariners’ Church. In 1906 the tiny church was no longer adequate for the growing numbers of sailors in Sydney and the building was enlarged and remodelled. It then boasted accommodation, a hall for concerts and dining, smoking rooms, a library and a gymnasium. The original chapel was converted to a recreation hall. A former mariner himself, the then New South Wales Governor, Sir Harry Rawson, advocated the proposal and in 1909 laid the foundation stone for the extensions. The mission operated from the enlarged and remodelled building until the 1970s. During that decade, it was one of many sites saved by ‘green bans’ – campaigns to protect The Rocks from demolition – and which are now heritage listed. The mission building operates today as a function venue, with such rooms as The Chapel (which maintains the cathedral ceiling and some of the original stained-glass windows) and the Rawson Room. The name ‘The Rawson Institute for Seamen’ that once proudly graced the building’s front is still visible. Rawson Institute For Seamen – The Rocks, Sydney, New South Wales. Formerly The Mariner’s Church. Image via Wikicommons. 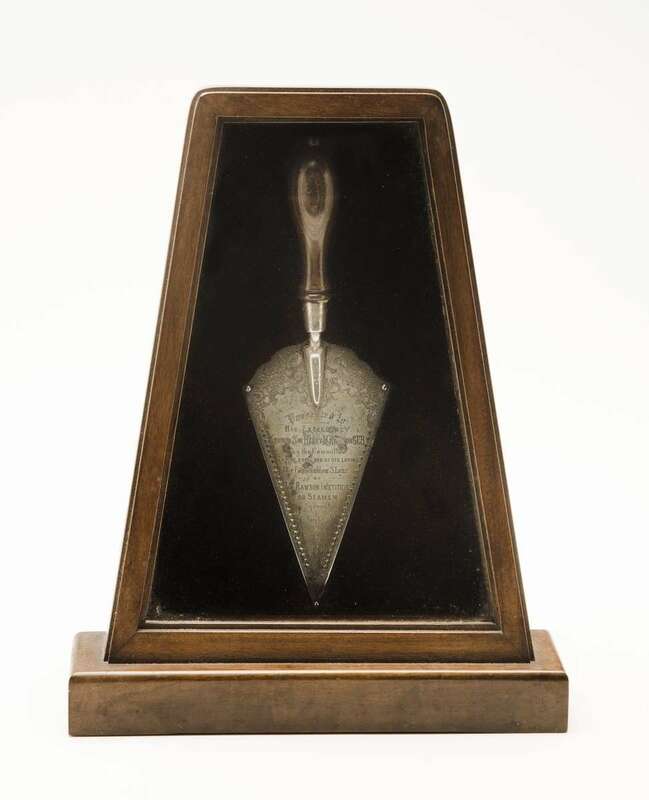 Silver presentation trowel, presented to Admiral Sir Harry Rawson GCB for use in laying the foundation stone of the Rawson Institute for Seamen, 18 March 1909. ANMM Collection 00054907 Gift from Mission to Seafarers. Image: Emma Bjorndahl/ANMM. Foundation stone of the Sydney Bethel Union’s Mariners’ Church. It was removed from the original Mariners’ Church in Erskine Street, East Darling Harbour, in 1844. The Sydney Bethel Union later merged with the Missions to Seamen. ANMM Collection 00054930 Gift from Mission to Seafarers. Image: Emma Bjorndahl/ANMM. Over the years, as the nature of shipping changed, so too did the mission. But unlike many other 19th-century charitable religious organisations, the mission did not fade away. After relocating several times and finally becoming known as The Mission to Seafarers in 2000, in 2012 the mission once more sold its Sydney location – the wonderfully named Flying Angel House – that it had occupied since 1993. At the time of this move, the Mission to Seafarers decided to approach the Australian National Maritime Museum with an offer of some of an extensive collection of material it felt would be better preserved in a museum. 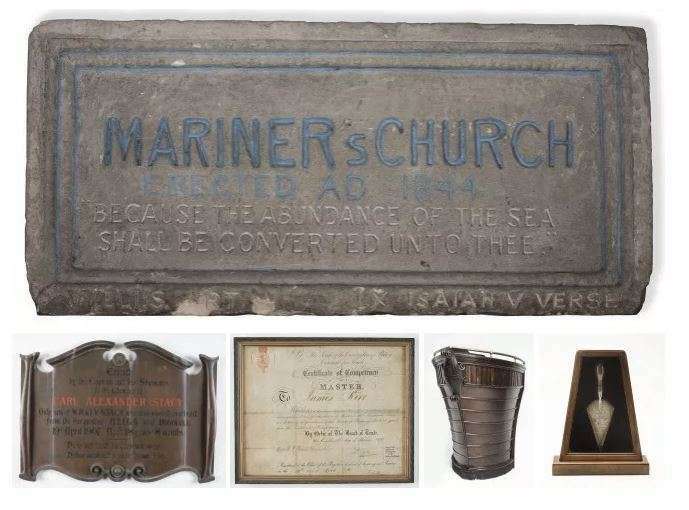 The eclectic collection ranges from the 1844 foundation stone of the original Mariners’ Church, a series of brass memorial plaques to people who died at sea, a presentation trowel, a velvet-covered pocket bible and a booklet titled ‘Service for the Burial of the Dead at Sea to meet the need of Masters on merchant marine and maritime service vessels’, produced by the mission. 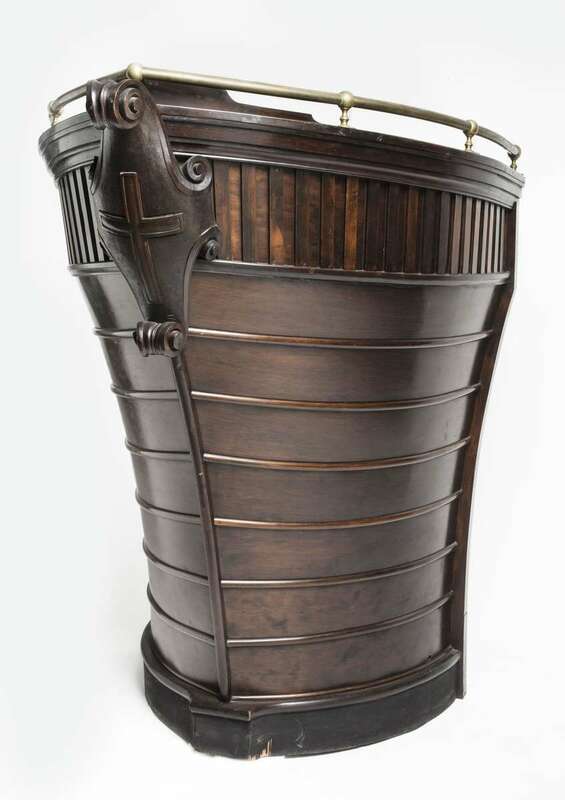 Perhaps the most dramatic object of all is a large wooden ‘lifeboat pulpit’ in the shape of a ship’s prow. Pulpit in the shape of a ship’s prow, known at the Mission to Seafarers (Missions to Seamen) as the Lifeboat Pulpit, c1928. The original stand or stairs have been removed. ANMM Collection 00054931 Gift from Mission to Seafarers. Image: Emma Bjorndahl/ANMM. The Mission to Seafarers’ collection will allow the museum to interpret the many evocative stories associated with the welfare of foreign and Australian sailors in the port of Sydney, and the often neglected, but once prominent, role of the mission here (and worldwide). It will complement the digitisation project being undertaken by the Mission to Seafarers Victoria (established in 1857; see Signals 110, March 2015), which is providing online access to the mission’s extensive archive of documents and photographs. It will also provide a strong element for the new narratives and stories being developed by the museum for future exhibitions, reminding us of the once strong connections between sailors and spirituality engendered by the ever-present connection to the sea. This article originally appeared in Signals 122 (March 2018). Uncover more maritime history and stories in our quarterly magazine Signals.